Alexei Monroe is a non-aligned cultural theorist and freelance editor from London. He holds a PhD in Communication and Image Studies from the University of Kent. 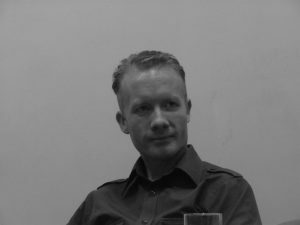 He is author of the books Pluralni monolit (Plural Monolith, MASKA 2003) and Interrogation Machine (MIT Press 2005). These books deal with the Slovene arts movement Neue Slowenische Kunst (NSK). In Spring 2014, revised and updated French and German translations will be published by Le Camion Blanc and Ventil Verlag. In September 2010 he co-organised and moderated an international three-day symposium on the work of Laibach and NSK as part of Laibach’s 30th anniversary event, Red Districts, Black Cross. He was Programme director of the First NSK Citizens’ Congress held in Berlin’s House of World Cultures in October 2010 and edited the Congress documentation State of Emergence (Ploettner Verlag/Poison Cabinet Press 2011). Besides his work on NSK, he writes widely on the aesthetics and politics of electronic music. He is currently working on the project Doctor Who and the Death Factory, exploring links between the story lines and soundtracks of the 1960s and 1970s Doctor Who and industrial music. He also has an ongoing project on the cultural history of the Stag as a symbol. In October 2007 in Ljubljana he co-presented the research exhibition Jelenometry, which explored Stag symbolism. He has recently begun to research questions of architecture and cultural theory and has created the online project Architecture against Strategies. His work has been published in Contemporary Music Review, Central Europe Review, Kinoeye, Maska, The Wire, New Moment, AS and other publications in Britain, Serbia, Slovenia, Brazil, Belgium and America. He is a founder member of the Industrialised Culture Research Network and is also active as a DJ.